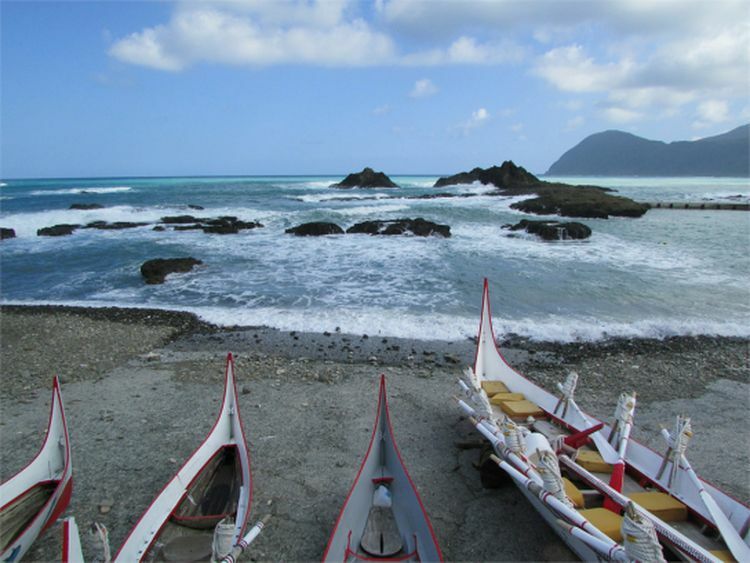 In its ecological tale of Taiwanese nature, author Wu Ming-Ye created an untouched fictional island paradise called Wayo Wayo. Today I visited a true Taiwanese Paradise, Lanyu Island or Orchid Island. This volcanic island with only 45 square km’s and almost 3000 people is famous for its unique fauna and for being the home of the Tao or Yami. In winter the boat trips to the island are few and erratic so I decided to buy a ticket in Daily Air, the only air company that regularly does its trips from Taitung to Lanyu. With my ticket reserved for 10.20 am, I woke up at 8 am and was once again surprised by the friendliness of the hostel owners. Not wanting me to pay the 350 taxi fee to the airport, they drove me there in their car for 200 and even bought me breakfast! I’ll always remember the way they were so hospitable towards me. After a 15 minute ride we reached the incredibly cute Taitung airport where I proceeded to pay the 1355 plane ticket (ouch! ), and do a cute check-in, passed a cute security gate to enter a really cute bi-motor airplane. I consider myself a person that is not usually afraid to fly, but the 20 minute trip to Lanyu must’ve been one of the most nerve wrecking flying experience I’ve ever had. The airplane only carries 16 to 19 people, and apart some wind and turbulence the first 15 minutes was fairly painless, allowing me to appreciate the amazing blue of the pacific and the Taiwanese coast line. However the story changed when we approached the small landing strip in the island. A strong wind kept shaking the plane sideways, and my heart went down abruptly when I saw smoke come out from the cabin. I later discovered it was just pressurised air. I was sweating profusely while other islanders talked normally while the airplane landed like a wounded bird. Betraying my allegiance with Matsu I started reciting Hail Mary’s and got mad at a woman for sneezing in such a crucial moment! When the plane finally landed, I was 20 years older and incredibly glad my return trip would be by boat. I take sea sickness to near life experiences any time of the day thank you. In the equally cute Lanyu airport I finally met face to face with Shamam Lamuran, my guide in the island, when a short and a friendly guy complimented me with an akoike, hello in Tao language. Akoike! Welcome to the Paradise! Shamam is from the Tao and Yami people, and later told me how curious their naming system is. When a man isn’t married and hasn’t kids a man gets different names from when he isn’t married, he hasn’t kids, for when he achieved all that and when he is an elder. Therefore he passed from Shimota, to Shimivilan to Shamam lamuran, with Shamam meaning “the father of our people”. He tells me he studied in Taiwan with a degree in Geography, his English is some of the best I’ve encountered and is knowledge of Tao culture is astonishing. We get into is much worn out van, which hilariously plays a Christmas song every time he does a reverse, and we drive to his village, Iratan.There’s six villages in Lanyu, all of them with different accents, Shamam tells me! Its rare beautiful day, uncommon at the winter season here as we arrive at the Lamuran’s guesthouse, the hostal Shamam opened 10 years ago, right next to his parents’ house. It’s a very pleasant home stay with light colours, a shared kitchen, showers, washing machine and even a small hanging net. The rooms are simple with a small mattress on the floor but thank god I’m not picky with the place I sleep. After leaving my luggage me and Shamam decided since I was only going to stay one month in Lanyu we should start the drive around the island immediately. We hopped into the van and headed started our clockwise tour in Lanyu. Our first stop, the traditional underground houses, or Fa’ay. Due to is location Lanyu is prone to suffer strong storms or typhoons, which lead the Tao to create the Fa’ai a below ground home that can resist anything the southeast Asian weather throws at them. “During the typhoon last year, the only gas station and the school in this area got completely destroyed while this house you see was intact,” he tells me while we crouch in the house small wooden rooms. We then stepped into the close Lanyu Flying Fish museum, where I get more detailed info about this unique culture. The Tao differs a lot from the aboriginal tribes from Taiwan due to their isolation. Instead of revolving around hunting, war and the mountains their culture revolves around the ocean and fishing. “We are also the only tribe who doesn’t brew alcohol,” says Shamam sadly, although the huge amounts of empty Taiwanese beer bottles I found in the different villages reveals they’ve found a suitable substitute. Tao culture is extremely focused on the fishing cycles, their most important festival is the Flying Fish season from February and Junefocused in the fishing, preparation and cooking of the very important fish for their diet. For this activity they use the magnificent Tatalas, the black, white and red canoes people can see scattered in the islands beach and have become the islands most recognisable symbol. Each of them belongs to a different family and launching a Tatala is considered one of the most important achievements of a Tao man, which needs to be able to build one using 27 plaques of wood and without nails. Another costume I really found interesting is their unique use of metal ceremonial hats, made from the scrap of boats who sunk in the island’s dangerous waters, and that makes them resemble astronauts from a 60’s sci-fi movie. After this culture shower we returned to the driving and proceeded with an incredible tour. The locals call the multiple goats who roam around the island “traffic lights” since they always have to stop when they cross the streets, and it really is impressive how many they are, climbing cliffs, houses, and scooters. The populations of cats, dogs and black pigs are also considerable, exceeding the human population largely I believe. I marvelled at all the huge volcanic rocks with shape inspired names and interesting stories. There is the Red Head rock with his lighthouse in the top, the Kokotai or crocodile rock, the Mantou or Dumpling rock, the Helmet rock and the Couple rock which got its name for resembling a couple arguing while the young son tries to separate them. My favourite was the Two Lions Rock, which resemble a male and female lion and was used in the old times as a discussion ground to discuss issues between villages. They would just step in front, each tribe in front of a different lion and argue. The Tao also don’t have written language so all their culture has to be passed orally, something Shamam is keen to do. He seems to know everyone in the island as he compliments every passing scooter and teaches me some basic Taroko language. Mikonan is goodbye and Ayoi is thank you. If you’re really thankfull just say Ayoiiiii. I also find it amusing the word for cow is the same as in Spanish, Baca, a trace of Spanish influenced coming from their ex-colony, the Philippines. It’s a wonderful drive, as we pass the villages of Yayou, Iearalay, Iranmeylek, Ivalino, Imowrod until we came back to Iratai. All in only three hours. We get a look at the magnificent Dongqing Bay in the East Coast, where the Pacific, or as the locals called “the big refrigerator” lazily goes against the black sand beaches of the island. Shamam tells me that in the last 5 years the number of tourists from Taiwan and foreign countries has risen immensely, especially during the summer, so I was lucky to come in very quiet time of the year. At one point the previously bumpy and poor quality road transformed into a smooth well preserved road into what seemed to be a modern complex.Incredibly the only road the Taiwanese government felt it should renew in the island is the road that leads to its controversial nuclear waste sight. In 1982, without taking into account the local population, the Taiwanese government decided to open a storage sight for where it could deposit the waste from the countrys three nuclear plants. After many protests by the Yami people, in 1996 the government accepted to stop sending nuclear waste to the area, however there’s founded fears that the storage 200,000 barrels are beginning to crack threatening to pollute the island’s pristine waters. We then complete our short circumnavigation I decided to walk to the nearby village of Imowrod. Owls, Nuclear Wastes, or Modernization, Who is the Real Anito? here we don’t show our culture for tourists like other aboriginals. We just live our lives peacefully and they end up coming. During a quiet walk on the seaside all I could see were friendly villagers talking and drinking, while kids and small dogs played around. Traditional platforms, in the old days used by Tao women waiting for their husbands to arrive from a day in sea fishing, were now used to have a nap while enjoying the sea breeze. Now the women still work in the small Taro and sweet potato fields while their husbands play cards and go to the convenience store. A lot has changed I thought while resting near a beautiful Tatal and watching the sunset. Luckily not too much. Believing the world was filled with Anito (evil spirits) the Tao fill all their Tatalas and houses with the sun symbol, which scares them away. They even place them on their churches, providing maybe they’re not too confident the Christian god will be very efficient at doing the same. Maybe I was contaminated by the laid back atmosphere since I end up sleeping in a hanging net with a local cat in my lap. When I woke up at 7 I discovered that all restaurants were already closed. Life really is laid-back around here. Shamam was nice enough to drive me around in order to find a place where I could have some traditional Lanyu food. After much looking we found a restaurant in a different village that served me a tasty meal of goat meet with Taro leaves. After that we headed to the nearby forest for some nocturnal searching. Shamam introduced me to a lot of unique island beetles and trees, including the so called Ghost Tree, which only blooms its delicate blue flowers during the night. However the biggest prize is to be able to see the elusive Lanyu small owl, or Tuturu as they call it. While to the Taroko the sight of an owl is a symbol of good news, precisely that the person will have a male son, to the Tao owls are symbols of bad luck and possible ghosts. Luck or not we could only hear their distant singing. I guess I just won’t have a son. When we returned to the homestay, I met Shamam’s mother who presented me with some amazing photo books of old pictures of Lanyu while is 70-year-old mom. She was being interviewed by Lenglengman Giling, a Paiwan Taiwanese girl doing a PhD for a university in Washington, focused on what the local Yami people think of the nuclear waste dump. After knowing she planned to stay during three months I felt I should’ve chosen a place like this for my master degree. I joined the conversation and had the chance to get a first-hand translation of Shamam’s mother personal history. Being the first Tao woman to ever receive an education in Taiwan, she recounted how the first time she went to Taipei in 1950, the amount of lights was so intense at night she believed it was still day. For more interesting indigenous stories? Follow us now on our page!